Indium6.4 Water-Soluble Solder Paste’s flux chemistry minimizes voiding under QFN and BGA assemblies. A typical water-soluble solder paste has approximately 15-30 percent voiding; however, Indium6.4 consistently yields less than five percent. Indium6.4 is manufactured with standard type 3 powder in Sn63, Sn62, and Indalloy100 (tin, lead, and silver). It joins Indium6.3 as one of Indium Corporation’s top-performing water-soluble solder pastes. 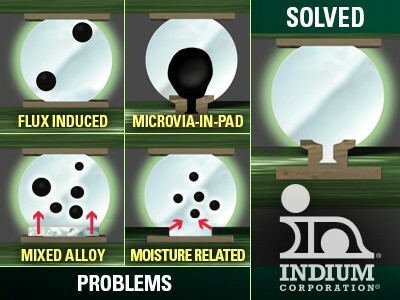 For more information on Indium6.4 and our other Indium Corporation solder pastes, visit www.indium.com/Indium6.4.